What’s it like to have cataracts? Imagine looking at everything through a fogged-up window and you’ll have somewhat of any idea what a cataract sufferer deals with. The older we get, the more likely cataracts become. Over 22 million Americans who are 40 or older currently have cataracts to some degree. Cataracts don’t appear out of nowhere. Typically, a cataract takes several years to slowly develop. While cataracts are certainly more common in the older members of the population, it’s possible to have cataracts when you’re younger. Even dogs and children can develop cataracts and experience cataract symptoms. Most cataracts are small and won’t bother your vision if you get them in your 40s or 50s. However, it’s when you’re over 60 that most cataracts start to cause noticeable changes to the ability to see and cataract symptoms begin to get worse. It’s not just aging. Poor lifestyle choices and other chronic health conditions can be contributing factors. The most common treatment for cataracts that impair vision is to have them surgically removed, but is surgery absolutely necessary? Research in 2015 is pointing toward an even simpler solution — eye drops that contain an organic compound that dissolves what forms cataracts in the first place. There are also scientifically backed and natural ways to prevent cataract formation, like getting a higher dietary intakes of eye vitamins from food and supplements. So yes, there are natural ways that you can prevent and slow the progression of these blurry-vision invaders and keep cataract symptoms at bay. 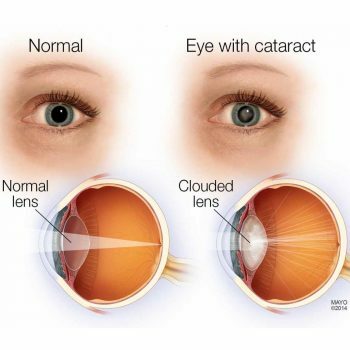 To put the cataract definition into simple terms — a cataract is a clouding of the eye’s natural lens. Cataracts are the most common cause of vision loss in people over 40. They’re also the main cause of blindness around the world. Around the not-so-old age bracket of the mid-40s, the human eye begins to experience biochemical changes involving the proteins within its lens. These proteins harden and lose elasticity, which can then lead to vision problems. One of the most common examples of this phenomenon is far-sightedness or the need for reading glasses in most people as they get older. For some, the proteins in the lens (specifically the alpha crystallins) may clump together, forming cloudy areas on the eye lens called cataracts. What is the lens, and why is it important? The lens, which lies behind the iris and the pupil, is a clear part of the eye that helps us to focus light or an image on the retina. The retina is the light-sensitive tissue located at the back of the eye. In a healthy eye, light passes through the transparent lens to the retina. When the light reaches the retina, it’s changed into nerve signals that are sent to the brain. In order to see a clear image, your eye’s lens must be clear. When the lens is literally clouded by a cataract, you end up seeing an inaccurate, blurred image. There are some common misconceptions when it comes to cataracts. It’s good to know that a cataract is not a film over the eye. It’s not caused by overusing the eyes and cannot be spread from one eye to the other. It’s also not a cause of irreversible blindness since surgery can remove cataracts. The more antioxidants you can get from consuming fruits and vegetables, the better your chances are of warding off cataract develop. The lens of the eye contains protective enzymes that ideally break down proteins that can clump together and form cataracts. By consuming more high-antioxidant foods, you protect your eyes from oxidative stress that contributes to cataracts. Antioxidants also help to maintain the enzymatic pathways that prevent cataract formation. Fresh fruits and vegetables — In general, fresh fruits and vegetables are excellent for eye health. Fruits and vegetables have high levels of important plant chemicals called phytochemicals. The phytonutrients are antioxidants and anti-inflammatory agents that have been shown to help prevent or delay the progression of eye disease, including cataracts. Studies have also shown that vegetarians and vegans have a significantly lower risk of cataracts than meat eaters, predominantly in the elderly. However, the research does not show that eating meat promotes cataracts — rather that eating a lot of vegetables is protective to eye health. Vitamin C-rich foods — Vitamin C intake has been linked to a lower cataract risk, especially in people who tend to be deficient in this key nutrient. Excellent vitamin C foods include peppers, citrus fruits, berries, tropical fruits, broccoli and tomatoes. Vitamin E-rich foods — Studies have shown that vitamin E reduces cataract formation. The top 10 vitamin E food sources include almonds, spinach, wheat germ and sweet potato. Zinc-rich foods — According to the American Optometric Association, zinc deficiency has also been tied to cloudy vision and poor night vision since it helps bring vitamin A from the liver into the retina. Grass-fed beef, kefir, yogurt, chickpeas and pumpkin seeds all rich in zinc. Fish and omega-3 foods — Regularly eating fatty fish like salmon and other foods like chia seeds that are rich omega-3 fatty acid, has been linked to a potentially reduced risk of cataracts or their progression. One study found that women who ate fish at least three times a week rather than less than once a month lowered their risk of cataracts, and overall, total fish intake was inversely associated with cataract formation. Protective sunglasses don’t have to be expensive, but opt for ones that block 100 percent of UV rays. While it’s a good idea to limit daily exposure to computers and other devices that give off blue light, it’s important get some light from the sun each day for the sake of your eyes and overall health. Decreasing alcohol consumption and quitting smoking are two lifestyle choices that can majorly decrease your cataract risk. Studies have shown that daily consumption of one or more alcoholic drinks was associated with a modest increase of risk for cataract, but this risk increased with greater alcohol consumption. In a recently published study conducted at the University of California, eye drops containing lanosterol completely cleared the vision of three dogs with naturally occurring cataracts after six weeks of treatment. The eye drops need several more years of human studies and likely might not work on aggressive cataracts, but hopefully they might become another option for cataract treatment in the near future.